The Queen of the Fruits! 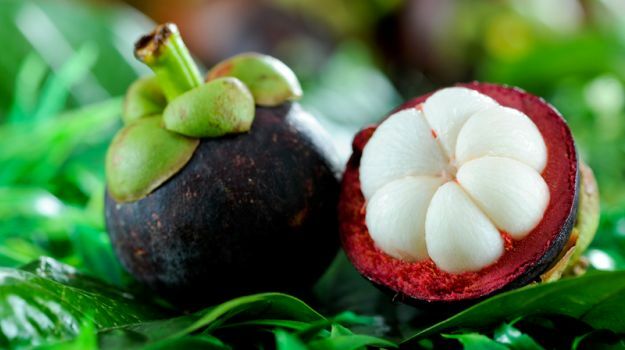 Also referred to as the Food of the Gods, Mangosteen is the sweet and tangy fruit grown in various parts of South-East Asia like Thailand, Malaysia and Singapore. It’s also the national fruit of Thailand. This purple colored tropical fruit has a white fleshy pulp, segmented with seeds, and has won the fancy of many chefs and home cooks for its refreshingly sweet & tangy flavor, including that of Queen Victoria of Britain. Legend has it that Queen Victoria had kept a reward price of 100 pounds sterling to whosoever would bring her the fresh purple mangosteen. Mangosteen is a rich source of antioxidants and vitamins. The special antioxidant found in abundance that gives the fruit a superior edge, is a class of naturally occurring polyphenol compounds known as Xanthones. 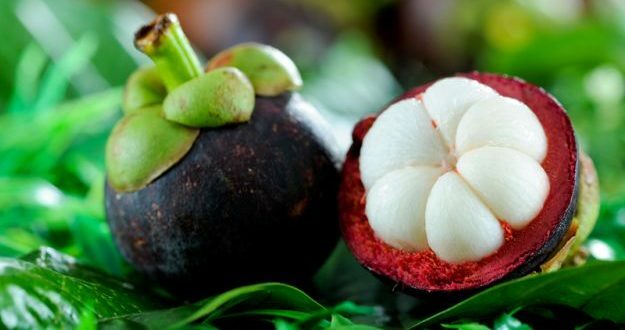 Mangosteen has two classes of Xanthones -alpha mangosteen and gamma mangosteen. The mangosteen fruit is said to contain at least 20 known Xanthones, majority of which are found in the fruit wall or pericarp of the fruit. These antioxidants protect the body from various diseases, ranging from common cold and flu, cancer risk and heart disorders. 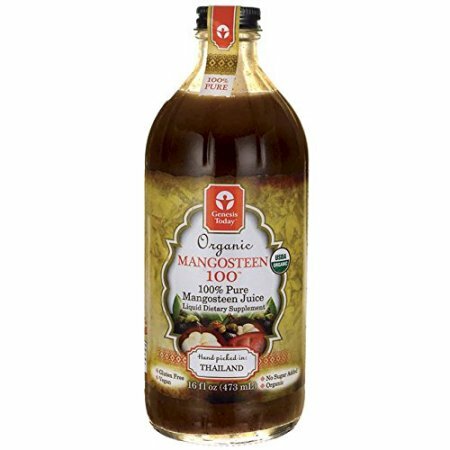 Mangosteen roots have been traditionally used in different parts of Indonesia for regulating menstrual cycles in women. The abundant quantities of potassium, copper, magnesium, and manganese containing in mangosteen can help regulate your blood pressure. Potassium especially weeds out the negative effect infused by excess intake of salt (sodium). It also promotes heart health by maintaining normal heart rate and keeping risk of coronary attacks at bay. Mangosteen also reduces the cholesterol levels in your body, thus further checking the blood pressure and the consequent heart ailments. 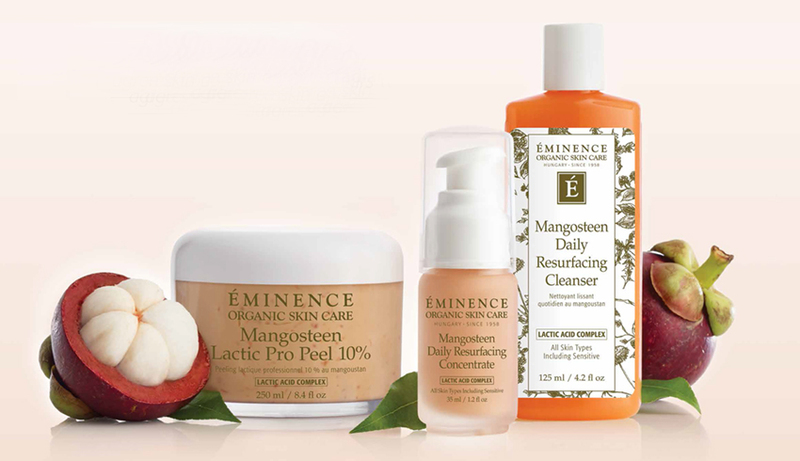 Mangosteen’s high antibacterial and antimicrobial properties and the star component Xanthone can bring down the risk of many skin diseases to a great extent by repairing the damaged cells. And who can overlook the high component of Vitamin C, which further boosts skin health. Mangosteen has also been used traditionally to treat acne. Its ability of scavenging free radicals coupled with the suppression of production of Cytokines (major contributor to acne) can prevent your skin from developing acne. Mangosteen can also reduce signs of aging. The signs of aging are also brought about by oxidative stress caused by free radicals, which is battled efficiently by the antioxidants of mangosteen. The antioxidant Catechin especially works wonders for your skin by preventing wrinkles. The Mangosteen has also been known to fight cancer, lower blood sugar and improve mental health! Although nearly impossible to find this amazing exotic fruit here in Hernando County at this time of year, we have ordered some 100% pure Organic Mangosteen Juice and will provide a “shot” of the slightly sweet crisp juice to everyone who indulges in April’s Mangosteen Radiance Facial of the Month with Frankie!